Is Your Pet A "Senior"? You've heard that one human year equals seven dog years. Dr. Fred Metzger, DVM, developed this chart to tell you if your pet is considered a "Senior". Your veterinarian can help you to learn more about the special needs of senior and geriatric dogs and cats. Senior dogs are the best. They know you well, you know them well, they are smart and seasoned and worth their weight in gold. They’re also worth special care to keep them well and happy for as long as possible. One particularly wise and simple precaution is to take a look at pertinent blood values whenever your veterinarian thinks helpful information could be gained. Normal results are great news, meaning a wide range of treatments and medications are available for your dog if needed. Abnormal results are good in a way, too, because they guide your veterinarian in making appropriate treatment choices for your dog’s individual situation. Drawing blood is simple for most dogs and relatively inexpensive: a bargain. The age your dog hits senior status varies by breed and other factors, so discuss this with your veterinarian. The checkups your dog needs change at this time of life, and you’ll want to keep a good schedule. X-rays, urine checks and other tests can bring huge benefits too. When you and your veterinarian know what’s going on in the dog’s body, you can adjust things that often make a world of difference in how the dog feels and behaves. The veterinarian’s role is to make the services available, and your role is to make decisions about what is best for your dog. Doing this well requires good communication so you’ll understand the pros and cons of the options. Hip dysplasia that may not have bothered the dog noticeably in younger years now may bring some bad days. Depending on the dog’s age and other factors, medication will likely help and surgery may be an option. You can restructure the dog’s environment and daily routine to eliminate the need to walk on slick floors, jump up to vehicles or furniture, or climb any substantial number of steps. Other orthopedic problems due to orthopedic defects, injuries or osteoarthritis may require similar measures to those needed for hip dysplasia. Work closely with your veterinarian to learn and stay current on just what movements are healthy for your dog and what movements are not. Hypothyroidism undetected in younger years can cause serious problems in the geriatric dog. When in doubt, this is one blood test you want. Thyroid medication is a safe treatment with extremely gratifying benefits for those dogs who need it. 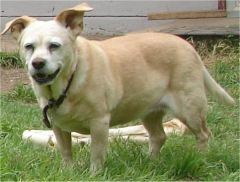 Senior dogs are the most prone dogs to cancers, so have any lumps or other symptoms checked promptly. Many cancers can be cured if caught early and in most cases you can at least have some good time with the dog to say a loving good-bye. Sometimes treatment can provide a normal lifespan or nearly so. Usually there are ways to relieve pain and other symptoms at least for awhile. Any way you look at it, you need to know as early in the course of the cancer as possible. Eye defects that progress over time may reach the point of blindness. Dogs can cope well with blindness if it’s not treatable, but you will want to make sure the condition is not causing the dog to be in pain. Old age is not a disease, and any change needs to be checked. Most things can be helped, at least to the extent of making the dog more comfortable and sometimes a great deal more than that. Some things can be completely cured. Some dogs get cognitive dysfunction, evidenced by mental confusion. This could be compared to changes that happen in some humans. In dogs as in people, it doesn’t happen to all of them. For those who do experience it, medication can help. If a dog has not been spayed or neutered by the senior years, infections become common for both males and females. Cancer of the reproductive organs is common, too. Avoid these risks by having spay/neuter done either when the dog is young, or when the dog’s breeding career is over. Intact female dogs can have estrous cycles lifelong, but they stop being fertile at some point, as do the males. Some degree of change in housetraining is normal with aging, too, for a variety of reasons. The dog with cognitive dysfunction may get confused about housetraining. Medication may help. The dog with orthopedic problems may find the elimination posture painful and put it off until control is lost and the dog has an accident. It may also be too painful for the dog to make the trip outside. Medication often helps these dogs. You may need to modify how the dog gets to the elimination area to make it less painful (or ideally not painful at all). Changes in the kidneys, liver, and other organs as well as medications needed by the dog can shorten the length of time the dog can hold bowels and bladder. Never blame a senior dog for housetraining accidents. Never expect that because a dog could hold it a certain number of hours in past years, the dog can do it for life. People change with age in these same ways. 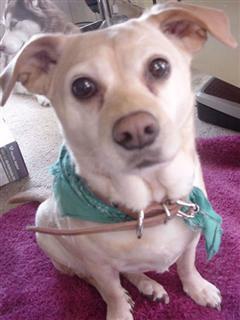 Senior dogs need and deserve extra care for their elimination needs. The necessary adjustments may be simple once the problem is identified. Senior dogs can keep learning, and they love to learn! Many of them are the smartest dogs on earth. Now is the time to turn their intelligence toward improving the quality of their lives. Teach your senior dog signals if the dog’s vision is still good. This will serve as a back-up if hearing fails, which it often does. Signals are fun for dogs and are a more natural language for them than words. Hearing loss can be moderate or profound. Grooming will help your dog cope with loss of vision as well as hearing. Handling your dog gently and thoroughly every day will give you a language of touch together. Your touch will help guide your dog. Also during these daily sessions you check your dog for any body changes, keep skin and coat in top health, and keep your relationship with your dog close and loving. Grooming done every day won’t hurt, because the dog won’t have tangles. Start this as early in your dog’s life as possible. Teach your senior dog composure, with Stay and Settle exercises (Downs without Sits—Sits can hurt) and training that gives the dog safer targets for human affection than jumping up. It’s quite simple to teach a dog to go to people’s knees for petting, by putting your hands at your knees when you call your dog, and instructing everyone else who pets the dog to do the same. Re-teach any risky games you are accustomed to playing into formats that take away the danger. One example is throwing toys high in the air for the dog to jump up, catch the toy, and land on just the hind legs. At any age, this risks injury to the dog. In the senior years, the risk goes up. Restructure this game by throwing items low, and teaching the dog to hold position until the item has landed and you give the cue before the dog runs after it. This uses the dog’s brain more, builds more happy anticipation, and will be more fun and exciting for the dog, as well as far safer. If your dog needs help getting up or walking now and then, there are various devices available. A simple one when only moderate help is needed is a padded nylon chest harness. This must be a nonrestrictive harness, NOT a harness designed to prevent a dog from pulling on leash. To aid the dog using the harness, keep steady pressure on the leash—changes in lead tension throw the dog off balance. Do not use this method without your veterinarian’s approval, since different conditions are sensitive to pressure at different points of the body. Work closely with your veterinarian when your dog is on a special diet for a medical condition. Your veterinarian needs to know if the dog won’t eat the food or has other problems with it. The dog’s weight needs to be checked and regularly noted in a medical log. Every single bite that goes into your dog’s mouth is part of the dog’s “diet,” so be sure not to ruin the benefits of a special diet with off-plan dog treats or people food. If your dog has had a job, find a graceful way to retire the dog, possibly in stages. Make good memories for yourself and others who are involved with the dog’s work, and let the dog’s final months of work be happy and successful. Try to avoid having your dog go out with an injury or failure that could have been avoided. Then give your dog a happy, well-deserved retirement with no regrets. There is no good day to lose a good dog, but time to say a loving good-bye is a blessing. Try to make the decision the dog would want, if the dog could know what you know. That leads to the best decisions in these matters. Think carefully about the timing of a new dog. Ending your senior dog’s life happily is top priority. Some older dogs will enjoy the company of a dog a few years younger or a pup, while others would hate it. You don’t want the care of the senior to keep you from doing a good job of training the newbie, or the training of the newbie to keep you from giving the senior the good care so richly deserved. If at all possible, try to avoid getting your dogs too close together in age. Losing them close together is even harder on you. Be kind to yourself when you lose your senior dog, and seek the company of people who understand this kind of loss. Most of all cherish your dog’s senior years. They pass too quickly, and they are wonderful times. Senior dogs are the best. It’s the time in a dog’s life when the love ripens, the intelligence blossoms, and you have the companionship of a wonderful friend. Make every day count. 1. Visit your veterinarian for a senior health care exam at least every six months to monitor changes in your pet's health. 2. As your pet approaches senior status, your veterinarian may recommend basic blood and urine tests as a baseline for measuring future changes. Regular blood testing can help identify diseases in their earliest and most treatable stages. 3. Note changes in behavior or appearance and see your veterinarian. Treat simple medical problems, such as incessant ear-scratching, immediately. A trip to the veterinarian can get problems under control early, before they become major problems requiring more extensive treatment. 4. Switch to a quality senior food that provides enhanced levels of key nutrients such as antioxidants, vitamin E and beta-carotene, plus gamma linolenic acid (GLA), a fatty acid important to skin and coat health. Some of the high quality senior diets we recommend include Eukanuba Senior Plus, and Hill's G/D Diet. 5. Ask your veterinarian to clean your dog's teeth regularly and follow the cleaning with recommended dental care at home. 6. Provide moderate exercise. This will help with weight control and keep muscles toned. 7. Talk with your veterinarian if your dog or cat tires easily or has trouble breathing. 8. Groom your senior pet at least once each week. Check for lumps, sores, parasites and foul-smelling ears or discharge. Older pets may need to he bathed with medicated or moisturizing shampoo. 9. Maintain a familiar routine and environment to minimize stress. 10. If your pet has not been spayed or neutered, ask your veterinarian about having this done to avoid tumors of the mammary or prostate glands.